Green Belt Relay Report 2017. Chris Kelly. 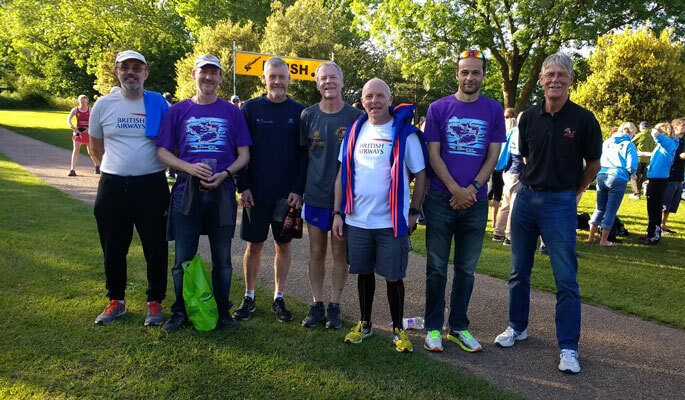 On 20-21 May 2017, BA completed the Green Belt Relay, for the 13th time, coming 20th of the 45 teams, in a time of 28:27:36 for the 218miles (average pace 7:49 min/miles). The Team was made up of 12 runners - Paul Knechtl, Richard Ruffell, Graham Taylor, Roderick Hoffman, Barry Walters, Neil Frediani, John Quertstret, James McFarlin, Murray Hogge, and Chris Kelly with one pair of stages split between 'injury-risk' Dave Dixon and 'only-training' Natalie Ruffell, with an injured Dave Bird and reserves Simon Ashford, Brian Bennett unable to run. We were ably supported by our Lead Driver, Nick Edge, and additional supporters & drivers Vicky, Julie, and Tony. Despite the last minute substitutions, an additional marshalling position, some late night schedule rearrangements, and some creative SatNav work by Google*, we managed to start and finish the 22 legs, ranging from 6 to 13.3 miles in length, climbing up to 1372ft, and marshal five different locations. At most of the marshal points we also provided water, although at some it was delivered as 'self-service'. We also drove up to 8 cars around large parts of the M25 - ideally we'd like to reduce that number in future - and besides the two generations in the team, one of our regular runners but this year supporting was working on developing a future runner for the 2037 event. There were some excellent mini-races within the race - witnessing Barry's unsuccessful dip for the line at the end of Stage 6 was exciting, as was the whole-hearted commitment from Graham to the finish sprint at Blackmore on Day 1. There were remarkable results - such as the injured Mr. Dixon's top-5 finish - and the just plain beautiful - Neil's finish at the top of Box Hill - mainly thanks to the landscape on a delightful Sunday afternoon, admittedly.